We have available hand hammered and hand tool designs in natural copper and also in silver finished copper. The top and the top rim of this handcrafted, Western style credenza are completely covered in natural colored, hand hammered copper. Below the top rim are two, small rectangular drawers, and centered in each drawer is a hand forged, iron handle. 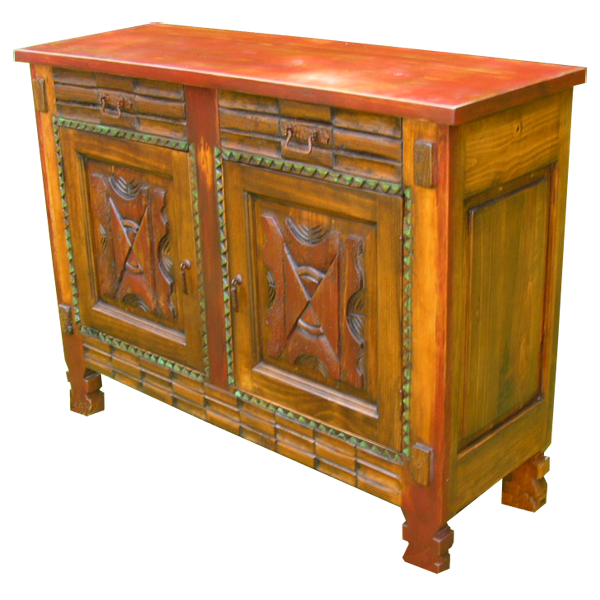 The credenza has two, solid wood, cabinet doors, and each cabinet door has hand carved, geometric designs on its face. On the side of each door panel is a hand forged, iron, pull handle. Each lateral side of the credenza has a rectangular cut panel, and the base has a mosaic, wood design. The credenza rest on hand carved feet, and the credenza is made with the best, sustainable, solid wood available. It is 100% customizable.